Taste test: These regular potato chips had the typical green speckles that you would associate with sour cream and onion potato chips. They looked normal enough, but the taste was horrible  truly awful. 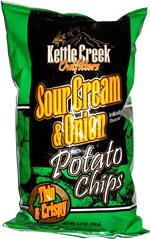 Possibly the worst-tasting sour cream and onion chips I've ever had. There's nothing wrong with the potato chip part, they were thin and crispy  it's almost as if the flavor powder had spoiled in some way. In no way did the taste replicate a normal sour cream and onion taste. Smell test: A slight oniony aroma.